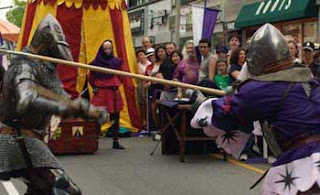 This festival site showcased Toronto's rich arts and cultural-entertainment scene featuring jazz, swing, big band, opera and orchestral music along with street theatre, dance and visual arts. Festival-goers visited Yonge & St. Clair for a truly unique and inspiring celebration of Toronto's vibrant arts community. The Greater World Outside Seeing The Toronto NightLife Blog. Toronto Night Life ( NightLife ), RMC BeBo entertainment reporting group. Toronto Night Life ( NightLife ), RMC Commercial WebSite.